This is the first site we visited in the Cool East area. 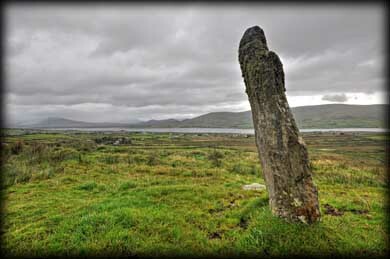 The ogham stone is located on the southwest slopes of Geokan Hill. It stands 2.4 metres high by 0.91 metres wide and roughly 0.3 thick. 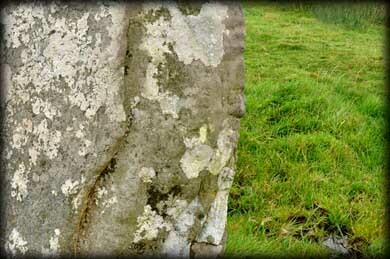 This huge monolith which has a pronounced lean to the east is very weather beaten and the ogham inscription has also suffered badly from cattle rubbing. Macallister R.A.S. interpretation in 1945 reads --ERRLONNA MAQI R[U]T[ENI] since then the ogham script has deteriorated even more, see image below. There is another ogham stone 400 metres northeast of here on the opposite side of the road. Situated: From Portmagee head northwest onto Valentia Island, Staying on the R565 for 3 kilometres. Then turn left for 1.3 kilometres. At the crossroads turn left. park at the next gate on your left. The stone is through the gate. Discovery Map 83: V 3741 7554. Last visit Sept 2012.